In December 1998, I received a dozen slides of still-life, landscapes and portraits created in oils and watercolors. It didn't take me long to pick up the phone and dial the artist who sent them to me. "Is this Natalia?" I asked. "Yes, the woman, replied in a thick Russian accent. "I'd like to have your work in my gallery, if you're still interested." Less than a week later, Natalia, her six month old boy, Daniel, and her husband brought an armful of artwork to my gallery in downtown Marshall. Thus began our professional and personal relationship. Natalia and I are the same age and have shared some of the same struggles in the past ten years. What I appreciate about Natalia is her optimistic nature and her ability to find beauty and harmony in the human condition and translate this into her art. Currently, Natalia, her two sons and husband, Sasha live in Tallahassee Florida. Originally from Novisibirsk, Siberia (In Russia) Natalia has traveled extensively throughout the world, thereby being exposed to a wide range of artistic styles and traditions. 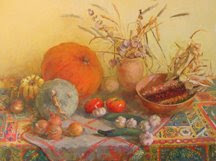 Among Natalia’s favorite themes are exquisite plein-air landscapes, depicting the subtlety of nature; still life, were vibrant shapes and internal dynamics are shown in contrast to the commonplace subjects; and figures and portraits brimming with humanity. Natalia holds a diploma from Novosibirsk State Pedagogical Institute. Her education includes postgraduate studies at the department of Painting and Composition at the Moscow Pedagogical University, and numerals workshops through out Russia and USA. Her work has been distinguished with honors and fellowships. ViewNatalia's paintings currently available at the Cycling Salamander.